It may seem obvious that rotted wood could be a bad thing for your home. If you live in an area with four seasons–many of them heavy with rain or snow–rotted wood can be a common occurrence as your house ages. However, we’ve seen many times where homeowners ignore this problem. Sometimes they feel like it’s a small issue or localized to one space, so they think it’s low on the priority list to repair. Unfortunately, this misconception could not be further from the truth. Wet rot and dry rot can not only spread and grow from one small area, it can potentially damage the structure of your home. But why should you replace rotted wood before painting? The following information will fill you in on why this step shouldn’t be ignored during a professional paint job. Mold and fungus grow on both wet rot and dry rot. If you don’t repair and replace this damaged wood, mold and fungus will continue to grow in and under (and potentially through) your paint. Mold and fungus in your walls and paint is incredibly dangerous for your health, especially if you have people with existing allergies living in your home. We know you loved that perfect silvery grey…except it was painted over an area with rotted wood and now it looks more like a dull brown! You can try repainting, but the damaged wood will continue to “leak” out its rot into your paint color. Rotted wood tends to soak up liquid. It will do that to your paint, requiring more and more coats (which will then crack and bubble). The problem may be a deeper issue than simply rotted wood. That rotted area could be a sign of a more serious compromise to your home. Professional painters will dig in and replace the area completely which could help them discover small problems long before they become big ones. What if I Need to Repair Rotted Wood? Sometimes, rotted wood won’t need replaced, but repaired. 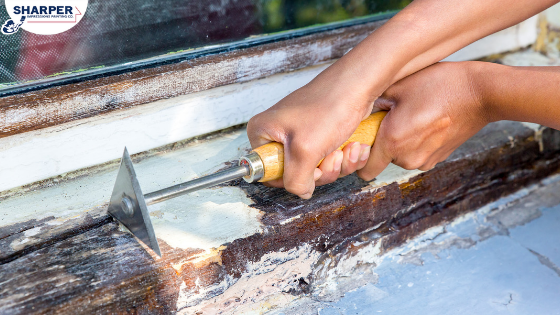 Minor wood repair may consist of simple caulking of small wood knots and splits or bonding medium sized holes and cracks. We always recommend that if you’re looking to paint and you’re not sure if the wood you’d like to paint is compromised, bring in a professional. A reputable company will offer a free estimate and include the cost of replacing or repairing the rotted area in their quote (in fact, they will not proceed with painting unless the area is restored). Make sure you’re not throwing hundreds of hours and dollars down the proverbial drain by getting this step right. Properly repaired and restored areas that once had rotted wood will lead to both a more beautiful finish and peace of mind that your home is not compromised. Save time, money and costly bigger issues by working with a reputable painting company. We offer free estimates and wood replacement and repair services when necessary. Contact us today for a free quote! Home » Recent Projects » Replacing Rotted Wood: Why Should You Replace Rotted Wood Before Painting?